HRG Services has been repairing and restoring sash windows across the south west for years. Sash windows have become a mainstay and defining feature of British architecture but not many people know how this iconic window style came into being, well today you’re in luck. For a long time it was presumed that sash windows originated in Holland during the early 16th century, however recent research undertaken by University of Newcastle indicates that they could have been invented in the UK much earlier. The development of sash windows reflects the development of better glass-making techniques, and the search for a window that didn’t detract from the aesthetics of a building. In the 16th century, leaded casement windows were rapidly falling out of fashion. They were draughty, let relatively little light into a building and when opened they detracted from the appearance of a building. The development of more efficient, and higher quality glass making techniques enabled larger panes of glazing to be fitted into windows without the need of leading. This revolutionised window design, leading to the sash window as we know it. Sash windows are made up of two movable glazed panels that slide vertically (or horizontally) to open. To help with opening, the weight of the panels is balanced with a metal sash weight that is connected to the window by a sash cord. This cord runs over a pulley at the top of the window frame. The word sash comes from the French, ‘Chassis’ which means frame. Sash windows utilised large glazed panels, let in increased amounts of natural light and actually enhanced the overall aesthetic of the building when open, thanks to their symmetrical proportions. They rapidly overtook casement windows as the window of choice for the 17th century upper classes. 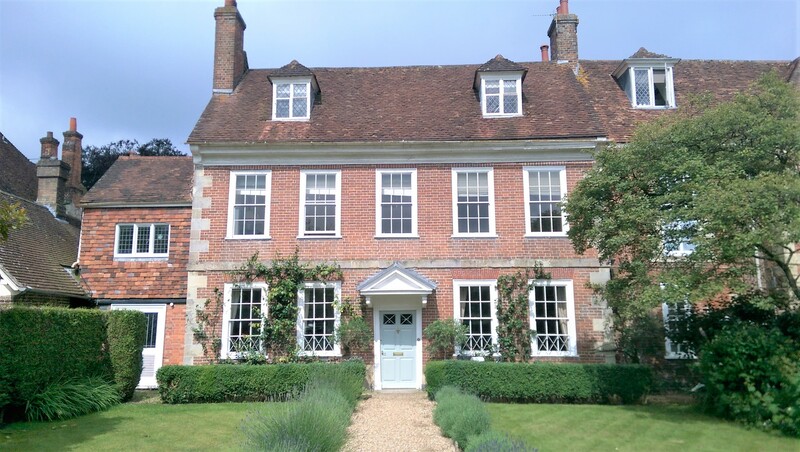 The earliest known surviving sash window found in a UK property is at Ham House, Richmond and dates from the 1670s. Due to the fact that they were notoriously expensive to create, early sash windows became a status symbol for the elite: the bifold doors of the 17th century if you will. An example of this can be seen in the type of glazing used in early sash windows. This would have been ‘crown’ glass: handmade by blowing. Naturally this was an incredibly difficult and labour intensive process and was incredibly expensive, putting it out of the financial reach of most households. It was in the Georgian period (1714–1830) that the characteristic layout of sash windows was properly developed. Georgian sashes have a unique ‘6 over 6′ arrangement. This simple, proportioned design, with thin astragal bars, helps to keep the aesthetic of the window decidedly understated and doesn’t detract from the overall appearance of the building. The Georgian sash arrangement has remained a popular configuration throughout the years. It was during this period that they gained popularity in the 13 British colonies which would then become the United States, as a result of the British Empire, sash windows can be found all over the Commonwealth. By the Victorian period glazing technology had developed again and mass-produced ‘sheet’ glass had become a reality. This was much cheaper to make and meant that larger areas of glazing could be incorporated into sash windows. As a result, the burgeoning middle classes could now take advantage of the benefits of sash windows. Victorian sash windows are characterised by their incredibly ornate astragal and glazing bars, intricate detailing and large glazed panels, reflecting their widespread use in Neo-Gothic architecture. During the latter part of the period, many craftsmen had begun to build sashes in a standard size of 4 foot wide. By the turn of the century, sash windows were becoming increasingly detailed. An example of this can be seen in the way that intricate moulded transoms were often run across the meeting rail and mounted on the sash frame itself. However, their popularity was beginning to decline. The popularity of the mock-Tudor style had led to a return in the widespread use of casement windows. After the First World War, due to the fact they required sophisticated manufacturing techniques, sashes were relegated in favour of easier to make, steel and timber casement windows. The popularity of sash windows is at an all-time high, thanks to property owners who want to add traditionally and heritage aesthetics to their property. Sash window restoration, like we offer here at HRG Services, is becoming increasingly popular, as homeowners look to revitalise existing timber sash windows in their properties. Many companies now even offer mock-timber sash windows, made from uPVC, that emulate the looks, configuration and opening operation of traditional timber sashes. If you thought that sash windows were consigned to the history books, think again.